Background: Dexmedetomidine, is a selective α2-adrenoceptor agonist that is used as an adjuvant mixed with local anesthetics during regional anesthesia. This study was designed to test the efficacy of adding dexmedetomidine to bupivacaine during placement of infraclavicular brachial plexus blockade (ICB). Methods: Sixty adult patients were divided into 2 equal groups of 30 subjects each. Patients in Group I received an ICB using 30 mL of 0.33% bupivacaine and Group II patients received 30 mL of 0.33% bupivacaine mixed with 0.75 μg/kg of dexmedetomidine. 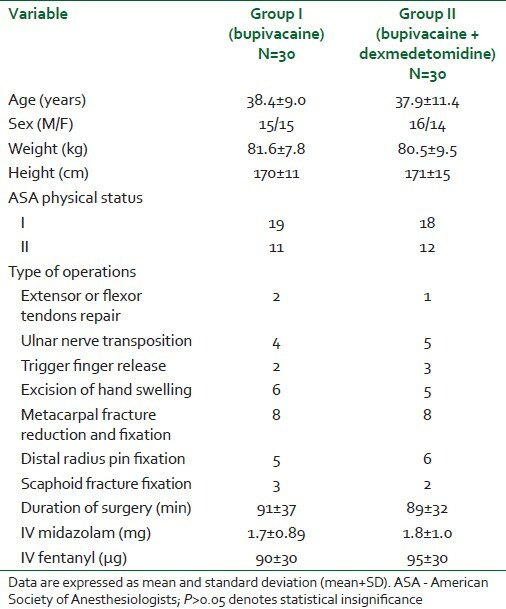 The following brachial plexus nerve block parameters were assessed: block success rate, sensory onset time and duration, motor block onset time and duration, analgesic pain scores using the verbal rating scale (VRS) for pain, duration of analgesia, and amount of supplemental intravenous (IV) morphine required. Results: There was a statistically significant shorter time to onset of sensory blockade (13.2 vs 19.4 min, P=0.003), longer duration of sensory block (179.4 vs 122.7 min, P=0.002), shorter onset time to achieve motor block (15.3 vs 22.2 min, P=0.003), longer duration of motor block (155.5 vs 105.7 min, P=0.002), lower VRS pain scores, prolonged analgesia (403 vs 233 min, P=0.002), and lower morphine rescue requirements for 48 h after surgery (4.9 (0-8.0) vs 13.6 mg (4.0-16.0) mg, P=0.005). All patients recovered without evidence of sensory or motor deficit. Conclusion: Adding dexmedetomidine to bupivacaine during the placement of an ICB provides: (1) enhancement of onset of sensory and motor blockade, (2) prolonged duration of analgesia, (3) increases duration of sensory and motor block, (4) yields lower VRS pain scores, and (5) reduces supplemental opioid requirements. Clonidine, an α2-adrenergic agonist, has been added to local anesthetics used during regional anesthesia. A recent meta-analysis has demonstrated that adding clonidine to intermediate and long-acting local anesthetics during a single-shot peripheral nerve or nerve plexus block provides a longer duration of analgesia and motor blockade by approximately 2 h.  Dexmedetomidine, a selective α2-adrenoceptor agonist, has been used as an adjuvant during regional and local anesthesia.,, Animal and human studies have shown safety and efficacy of adding dexmedetomidine to local anesthetics in various regional anesthetic procedures, such as subarachnoid, epidural, and caudal injections, yet other investigations have reported reduced or negative analgesic effects when using dexmedetomidine. ,,,, However, there remains limited knowledge on the analgesic efficacy and clinical utility of adding dexmedetomidine to local anesthetics during peripheral nerve and nerve plexus blockade in humans. , Therefore, this study was designed to investigate the efficacy of dexmedetomidine as an adjuvant in combination with local anesthetic solutions during an ICB for upper extremity surgery. So it has been hypothesized that dexmedetomidine may improve overall efficacy during an ICB. Patients were randomly chosen to receive either bupivacaine + placebo (group I, n=30) or bupivacaine + dexmedetomidine (group II, n=30) by computer-generated random selection. Randomization was performed by an independent statistician and concealed from patients and investigators until completion of statistical analysis. The local anesthetic mixtures (placebo vs dexmedetomidine) for injection were supplied by the pharmacy and patients and health care providers involved in patient care were blinded to the drug combinations. Exclusion criteria included the following: patient refusal, patients with chronic pain, those using chronic analgesic medications, coagulopathy, history of brachial plexus injury, allergy to the study drugs, patients taking other medications with α-adrenergic blocking effect, hepatic or renal insufficiency, systemic infection or infection at the site of injection, and shoulder surgery. Patients were instructed preoperatively about use of the verbal rating scale (VRS) for pain assessment (VRS: 0 = no pain, 10=worst pain possible). Patients were given 1-2 mg of midazolam intravenous (IV) as a premedication 10-15 min before beginning each block technique in addition to 50-100 μg of fentanyl just prior to block needle insertion. Subcutaneous injection with 4 mL of 1% lidocaine was administered at the needle insertion site. Patients were continuously monitored throughout the procedure with continuous electrocardiogram, pulse oximetry, capnography by nasal cannula, and noninvasive blood pressure. Patients were placed supine and their head turned away from the side to be blocked. The probe (8-12 MHz) of a Hewlett-Packard 77020A ultrasound machine (Andover, MA, USA) was positioned in the parasagittal plane near the coracoid process to best visualize a cross-sectional view of the axillary artery. A 10 cm 18-ga insulated needle (Plexolong; Pajunk, Geisingen, Germany) attached to a nerve stimulator (Stimuplex® ; Braun, Melsungen, Germany) was inserted inplane to the ultrasound probe. Initial stimulating current was set at 0.6-0.8 mA. The brachial plexus was typically reached at 6-9 cm and the stimulating current was then gradually decreased eliciting a motor response at 0.3 mA or less. Muscle twitches from biceps muscle was not accepted (musculocutaneous nerve may have branched from the brachial sheath) and if obtained, the needle would be redirected inferiorly and slightly medially to achieve median, radial, or ulnar nerve stimulation. Stimulation of the axillary nerve (deltoid muscle twitch) was not accepted (axillary nerve is often outside the brachial sheath at this level of the brachial plexus) and if obtained, the needle was redirected more superiorly. Only motor responses (twitches) from the triceps, forearm, and hand muscles were accepted prior to local anesthetic injection. Aspiration was performed to detect an unintentional intravascular needle placement prior to a test dose of 4 mL of 1% lidocaine with epinephrine (5 μg/mL) followed by the loading dose of local anesthetic administered incrementally. The injectate contained either 30 mL of 0.33% bupivacaine + placebo (Group I) or 30 mL of 0.33% bupivacaine + 0.75 μg/kg of dexmedetomidine (Group II). All of the subjects had a brachial plexus catheter placed prior to block needle removal for continuous administration of analgesic medication. Dexmedetomidine hydrochloride (Precedex® , manufactured by Hospira, Inc. Lake Forest, IL, USA) was supplied in 100 μg/mL and both bupivacaine and dexmedetomidine were diluted in physiological saline to achieve a mean pH of 5.6. The same volume of saline (placebo), corresponding to that of dexmedetomidine, was added to bupivacaine for the bupivacaine + placebo group (Group I). Any evidence of clinical criteria suggesting local anesthetic toxicity (lightheadedness, dizziness, tinnitus, disorientation, drowsiness, generalized muscle twitching, convulsions, respiratory depression, cardiovascular depression, and collapse) in addition to possible systemic effects of dexmedetomidine, such as bradycardia, hypotension, fainting, and somnolence were recorded. Postoperatively, all patients received patient controlled analgesia (PCA) with IV morphine at 1 mg bolus with a 10 min lockout period and a maximum hourly limit of 5 mg. In addition, 1 g of oral paracetamol was prescribed regularly every 6 h starting at 6 h postoperatively. An ICB was considered successful when evidence of dermatomes of the brachial plexus (C5-T1) were blocked by the original injection within 30 min. The block was considered incomplete if any supplemental local anesthetic was needed for complete anesthesia and the block was considered to have failed if a supplementary volume did not provide complete anesthesia. Sensory blockade was assessed every 3 min and motor block was evaluated every 5 min within the first 30 min following completion of drug administration. Sensory block was confirmed by loss to cold sensation using an alcohol swab and pinprick sensation using a 23-ga needle in all dermatomes of the brachial plexus (C5-T1). Sensory block onset was defined as a decrease of sensation to 25% or less by comparison to the contralateral limb as a reference. Sensory block duration was defined as the time from injection of local anesthetic mixture to complete recovery from cold and pain sensation as tested by an alcohol swab and pinprick, respectively, in all dermatomes of the brachial plexus (C5-T1). Motor blockade was evaluated by the ability to flex the elbow and hand against gravity as follows: grade 1 = ability to flex and extend the forearm; grade 2 = ability to flex or extend only the wrist and fingers; grade 3 = ability to flex or extend only the fingers; and grade 4 = inability to move the forearm, wrist, and fingers. Onset of motor block was defined as the time from injection of local anesthetic mixture until achieving a reduction in motor power to grade 3 or less. Motor block duration was described as the time from injection of local anesthetic to complete recovery of motor function in all nerves dermatomes. Sensory and motor blockade duration were assessed every 10 min in the postoperative period. Pain scores were assessed using the VRS (0-10) where pain was evaluated during rest, at 1, 2, 12, 24, 36, and 48 h postoperatively. Duration of analgesia (time interval from completion of local anesthetic administration until first need of rescue analgesia in the form of IV morphine, PCA) and amount of IV morphine consumed during the postoperative 48 h were recorded. Any evidence of neurologic, gastrointestinal, and cardiopulmonary complications were also recorded. Primary outcome measures were duration of analgesia while secondary measures were onset and duration of sensory blockade, pain scores, motor blockade onset and duration, narcotic requirements, and evidence of any adverse drug reactions. A power analysis was performed to determine the necessary number of patients for each group based on duration of analgesia. With a 2-sided type I error of 5% and study power at 80%, it was estimated that 25 patients would be needed in each group in order to detect a difference of 35 min in the duration of analgesia between the 2 groups. Kolmogorov-Smirnov test was used to verify normal distribution of continuous variables. Continuous variables are expressed as mean ± standard deviation or median with interquartile range as appropriate and categorical variables are reported as percentages. Statistical analysis was done using Statistica version 6 (StatSoft Inc.; Tulsa, OK, USA; 2001) and GraphPad Prism version 4 (GraphPad Software Inc.; San Diego, CA, USA; 2005) software. Distributed continuous variables were compared using Student's unpaired t-test, whereas Mann-Whitney U test was used for comparison of VRS pain scores and supplemental morphine requirements. Categorical variables were compared by Chi-square test or Fisher's exact test, as appropriate. All analyses were two-tailed and P<0.05 was considered statistically significant. 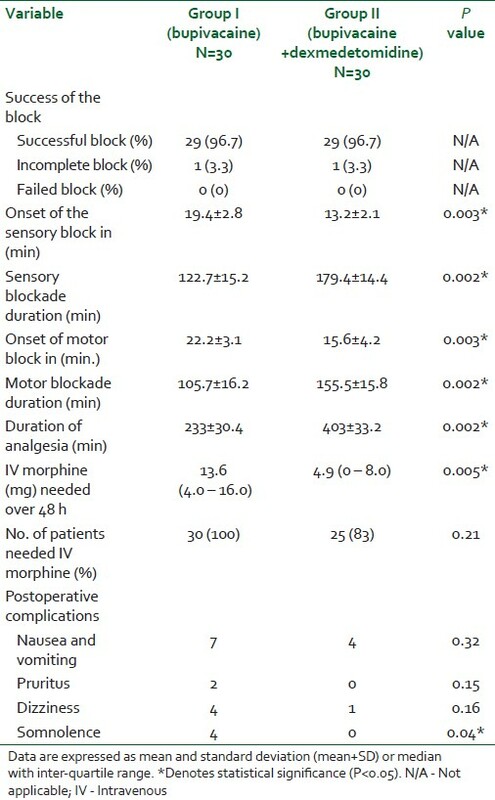 Both groups of patients had comparable demographic variables, duration of surgery, and intravenous sedation for block placement (P>0.05) as shown in [Table 1]. Both groups were similar regarding the motor twitch response where 8, 5, 7, and 10 subjects from Group I developed twitches of the pectoralis, triceps, forearm, and hand muscles, respectively, while 7, 6, 5, and 12 patients of Group II developed twitches of the pectoralis, triceps, forearm, and hand muscles, respectively. Successful blockade was achieved in 96.7% of patients in both groups and all patients recovered uneventfully without sensory or motor deficit and no evidence of respiratory depression, bradycardia, or hypotension reported. The dexmedetomidine group of patients (Group II) showed a statistically significant shorter time to onset of sensory blockade (13.2 vs 19.4 min, P=0.003), longer sensory block duration (179.4 vs 122.7 min, P=0.002), shorter onset time to motor blockade (15.3 vs 22.2 min, P=0.003), longer motor block duration (155.5 vs 105.7 min, P=0.002), longer duration of postoperative analgesia (403 vs 233 min, P=0.002), and lower rescue morphine requirements 48 h after surgery. No patient in the dexmedetomidine group developed somnolence, whereas 4 patients in the control group (Group I) suffered from somnolence (P=0.04) [Table 2], [Figure 1]. 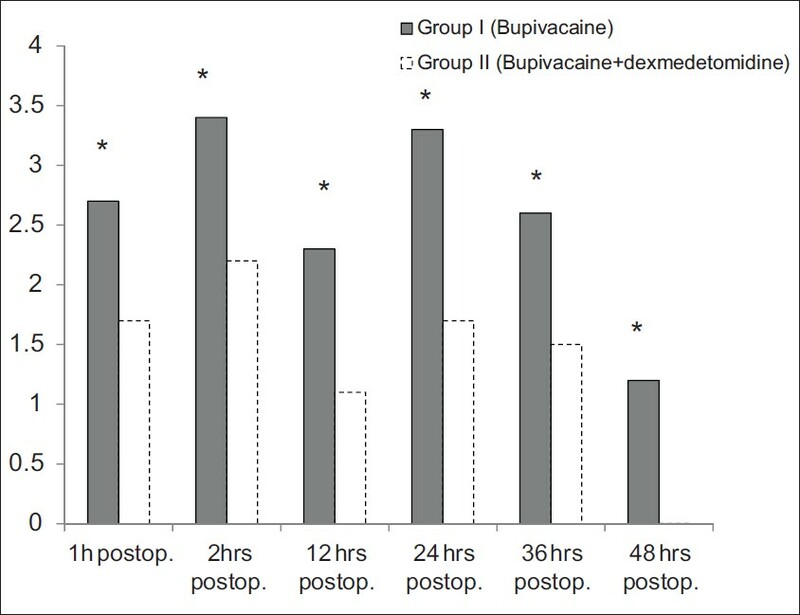 Saadawy and coworkers  added dexmedetomidine (1 μg/kg) to bupivacaine for caudal anesthesia in pediatrics; achieving longer analgesia, less rescue analgesic consumption, and improved sleep quality with no adverse clinically relevant side effects. El-Hennawy and colleagues  added either dexmedetomidine or clonidine to bupivacaine in pediatric caudal anesthesia for lower abdominal surgeries. Both dexmedetomidine and clonidine medications mixed with bupivacaine significantly prolonged analgesia when compared with using bupivacaine alone (16 h (15-19 h) for dexmedetomidine, 12 h (3-21 h) for clonidine, and 5 h (4-6 h) with plain bupivacaine; P<0.001). The study showed no difference with analgesia duration (P=0.796) between either dexmedetomidine or clonidine when added to bupivacaine. Some recent investigations have studied the effects of mixing dexmedetomidine with local anesthetics during peripheral nerve and nerve plexus blockade. A study by Obayah and colleagues  added dexmedetomidine to bupivacaine during placement of a greater palatine nerve block for cleft palate repair. The addition of dexmedetomidine to bupivacaine provided lower pain scores and prolonged analgesia (approximately 50%) with no negative effect on hemodynamics when compared with bupivacaine alone. Another study by Esmaoglu et al. mixed dexmedetomidine with levobupivacaine during placement of axillary brachial plexus blockade that resulted in shortening of block onset time and longer block duration resulting in improved postoperative analgesia. Several animal studies have investigated the analgesic effects of dexmedetomidine as an adjunct. A study performed on a rat model by Brummett and colleagues  reported that dexmedetomidine added to ropivacaine during sciatic nerve blockade provided longer analgesia than systemic administration. Local injection of dexmedetomidine alone provided a brief period of analgesia that may suggest a peripherally mediated mechanism for the analgesic action of dexmedetomidine. Another study in guinea pigs  added clonidine or dexmedetomidine to lidocaine that showed enhanced local analgesic effect. The authors Yoshitomi et al. postulated that improved analgesic efficacy of clonidine and dexmedetomidine was mediated through α2A-adrenoceptors. Another sciatic nerve rat model investigation (combined with histopathologic evaluation) assessed the efficacy and safety of adding dexmedetomidine to bupivacaine. In this study, Brummett and colleagues discovered that dexmedetomidine added to bupivacaine significantly potentiated sensory and motor blockade duration, however, dexmedetomidine alone failed to show any evidence of significant sensory or motor blockade. Histopathologic assessment of the sciatic nerves from the specimens in the study showed normal structure of axons and myelin. In another study by Brummett et al.,  they reported an antinociceptive effect of dexmedetomidine in a rat model with sciatic nerve blockade where perineural injection of dexmedetomidine mixed with ropivacaine resulted in prolonged duration to thermal protection/analgesia in a dose-dependent manner. The emphasis of this study was to assess clinical utility of adding dexmedetomidine to local anesthetics for brachial plexus blockade. Potential pharmacokinetic effects of adding dexmedetomidine to bupivacaine may explain some of the increased analgesic efficacy of the present investigation that may pose a limitation to the results of this study. Another limitation of this study could be that the beneficial effects of dexmedetomidine are explained by systemic absorption of the injected medication and by including a third control group (perineural bupivacaine + intravenous systemic dexmedetomidine) into the design of the study may help to address this issue. A relatively small dose of dexmedetomidine (0.75 μg/kg) was used in this clinical trial (concern about potential adverse hemodynamics, such as hypotension, bradycardia, fainting, and sedation), so the optimal dose must be furtherly investigated. Improved parameters of analgesic efficacy support the use of dexmedetomidine as an adjunct mixed with local anesthetics for brachial plexus blockade to improve pain management and prolong anesthesia duration of local anesthetics. This study was supported by finance from Minoufiya University, Egypt. We pay great thanks to radiology department staff, Faculty of Medicine, Minoufiya University, for their co-operation and help in using the ultrasound machine. 1. Raj PP, Montgomery SJ, Nettles D, Jenkins MT. Infraclavicular brachial plexus block-a new approach. Anesth Analg 1973;52:897-904. 2. Fitzgibbon DR, Debs AD, Erjavec MK. Selective musculocutaneous nerve block and infraclavicular brachial plexus anesthesia. Case report. Reg Anesth 1995;20:239-41. 3. Sandhu NS, Capan LM. Ultrasound-guided infraclavicular brachial plexus block. Br J Anaesth 2002;89:254. 4. Pöpping DM, Elia N, Marret E, Wenk M, Tramèr MR. Clonidine as an adjuvant to local anesthetics for peripheral nerve and plexus blocks: A meta-analysis of randomized trials. Anesthesiology 2009;111:406-15. 5. Virtanen R, Savola JM, Saano V, Nyman L. Characterization of the selectivity, specifity and potency of medetomidine as an á2-adrenoceptor agonist. Eur J Pharmacol 1988;150:9-14. 6. Ebert TJ, Hall JE, Barney JA, Uhrich TD, Colinco MD. The effects of increasing plasma concentrations of dexmedetomidine in humans. Anesthesiology 2000;93:382-94. 7. Yoshitomi T, Kohjitani A, Maeda S, Higuchi H, Shimada M, Miyawaki T. Dexmedetomidine enhances the local anesthetic action of lidocaine via an alpha-2A adrenoceptor. Anesth Analg 2008;107:96-101. 8. Brummett CM, Norat MA, Palmisano JM, Lydic R. Perineural administration of dexmedetomidine in combination with bupivacaine enhances sensory and motor blockade in sciatic nerve block without inducing neurotoxicity in rat. Anesthesiology 2008;109:502-11. 9. Kanazi GE, Aouad MT, Jabbour-Khoury SI, Al Jazzar MD, Alameddine MM, Al-Yaman R, et al. Effect of low-dose dexmedetomidine or clonidine on the characteristics of bupivacaine spinal block. Acta Anaesthesiol Scand 2006;50:222-7. 10. Brummett CM, Amodeo FS, Janda AM, Padda AK, Lydic R. Perineural dexmedetomidine provides an increased duration of analgesia to a thermal stimulus when compared with a systemic control in a rat sciatic nerve block. Reg Anesth Pain Med 2010;35:427-31. 11. Saadawy I, Boker A, Elshahawy MA, Almazrooa A, Melibary S, Abdellatif AA, et al. Effect of dexmedetomidine on the characteristics of bupivacaine in a caudal block in pediatrics. Acta Anaesthesiol Scand 2009;53:251-6. 12. Duma A, Urbanek B, Sitzwohl C, Kreiger A, Zimpfer M, Kapral S. Clonidine as an adjuvant to local anaesthetic axillary brachial plexus block: A randomised controlled study. Br J Anaesth 2005;94:112-6. 13. Obayah GM, Refaie A, Aboushanab O, Ibraheem N, Abdelazees M. Addition of dexmedetomidine to bupivacaine for greater palatine nerve block prolongs postoperative analgesia after cleft palate repair. Eur J Anaesthesiol 2010;27:280-4. 14. Esmaoglu A, Yegenoglu F, Akin A, Turk CY. Dexmedetomidine added to levobupivacaine prolongs axillary brachial plexus block. Anesth Analg 2010;111:1548-51. 15. Borgeat A, Ekatodramis G, Dumont C. An evaluation of the infraclavicular block via a modified approach of the Raj technique. Anesth Analg 2001;93:436-41. 16. Al-Ghanem SM, Massad IM, Al-Mustafa MM, Al-Zaben KR, Qudaisat IY, Qatawneh AM, et al. Effect of adding dexmedetomidine versus fentanyl to intrathecal bupivacaine on spinal block characteristics in gynecological procedures: A double blind controlled study. Am J Appl Sci 2009;6:882-7. 17. El-Hennawy AM, Abd-Elwahab AM, Abd-Elmaksoud AM, El-Ozairy HS, Boulis SR. Addition of clonidine or dexmedetomidine to bupivacaine prolongs caudal analgesia in children. Br J Anaesth 2009;103:268-74. 18. Brummett CM, Padda AK, Amodeo FS, Welch KB, Lydic R. Perineural dexmedetomidine added to ropivacaine causes a dose-dependent increase in the duration of thermal antinociception in sciatic nerve block in rat. Anesthesiology 2009;111:1111-9. 19. Singelyn FJ, Gouverneur JM, Robert A. A minimum dose of clonidine added to mepivacaine prolongs the duration of anesthesia and analgesia after axillary brachial plexus block. Anesth Analg 1996;83:1046-50. 20. Butterworth JF, Strichartz GR. The á -2-adrenergic agonists clonidine and guanfacine produce tonic and phasic block of conduction in rat sciatic nerve fibers. Anesth Analg 1993;76:295-301. 21. Nakamura M, Ferreira SH. Peripheral analgesic action of clonidine: Mediation by release of endogenous enkephalin-like substances. Eur J Pharmacol 1988;146:223-8. 22. Romero-Sandoval A, Eisenach JC. Perineural clonidine reduces mechanical hypersensitivity and cytokine production in established nerve injury. Anesthesiology 2006;104:351-5. 23. Romero-Sandoval A, Eisenach JC. Clonidine reduces hypersensitivity and alters the balance of pro- and anti-inflammatory leukocytes after local injection at the site of inflammatory neuritis. Brain Behav Immun 2007;21:569-80. 24. Foster RH, Markham A. Levobupivacaine: A review of its pharmacology and use as a local anaesthetic. Drugs 2000;59:551-79. 25. Kopacz DJ, Bernards CM. Effect of clonidine on lidocaine clearance in vivo: A microdialysis study in humans. Anesthesiology 2001;95:1371-6. 26. Vester-Andersen T, Eriksen C, Christiansen C. Perivascular axillary block III: Blockade following 40 ml of 0.5%, 1% or 1.5% mepivacaine with adrenaline. Acta Anaesthesiol Scand 1984;28:95-8. Abdallah, F.W. and Abrishami, A. and Brull, R.
Abdallah, F.W. and Brull, R.